Motorola Launches Square rotator phone Motorola Flipout in India for Price of Rs.15900. 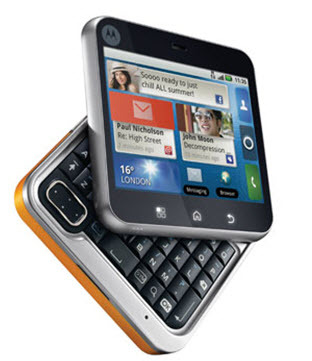 Motorola Flipout is Swivel styled phone equipped with 5 Row QWERTY Keypad, and well optmimzed to support social networking applications. Flipout Android Phone is equipped with loads of features some of them are: Java, Email, Document Viewer, Google Maps with Street View and much more. The device is designed as a square of the rotator with a touchscreen and QWERTY keyboard. Motorola FlipOut running an operating system, Android 2.1, and the interface v1.5 MotoBlur with Live Widgets. Among the characteristics worth mentioning 2,8-inch touchscreen, a 3-megapixel camera with support for the Kodak Perfect Touch (improving the quality of the image), electronic compass, and support audio technology CrystalTalk PLUS to implement sound engineering in good quality. Motorola FlipOut will be available in seven colors: white, green, red, crimson, blue, black (liquorice) and yellow-orange (saffron). Motorola Flipout Price in India:- Motorola Flipout will carry the expected Price tag of Rs. 15990. Note:-Motorola Flipout, was available on pre-orders at major online retailer Flipkart before launch.